Thursday night my great-niece and I met for dinner. She has moved back “home” after completing her degree at Texas Tech and working in Lubbock. It was our first time for a “girl’s night” and we had a blast. Yes, that’s her in the picture. No, that’s not at the restaurant, LOL. 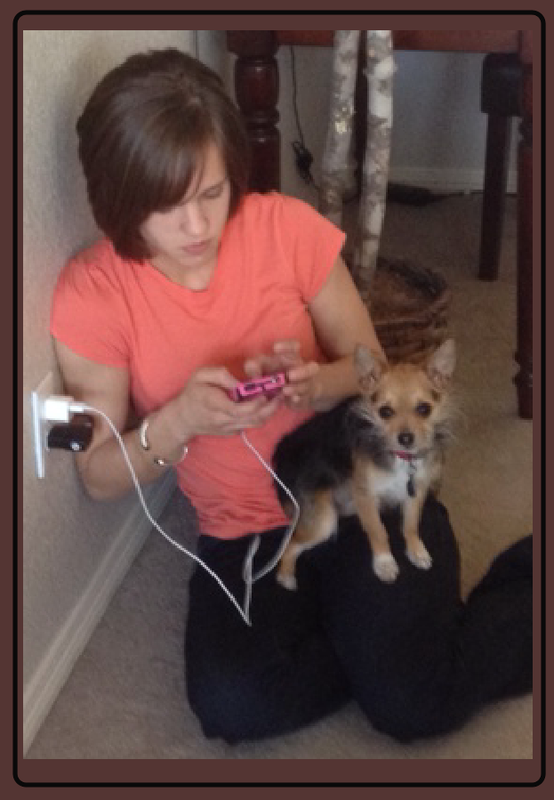 That is a picture of her and her Chorkie, Max, at her parent’s home on Saturday, but back to Thursday night…. We ate on the balcony and enjoyed the pretty weather, but somehow at some point in the evening, my wallet fell out of my purse. I did not discover it until the next day, and was extremely blessed and grateful when I called the manager and he said that it had been turned in. He was only going to be there until 3 so I left work a couple of hours early (a huge shout out to my supervisors for understanding! ), and I got there just before he left. My wallet was intact. 100%! Principle One – God is Absolute Good, everywhere present. Principle Two – Human beings have a spark of divinity within them, the Christ spirit within. Their very essence is of God, and therefore they are also inherently good. Belief in Principle One removes worry, does it not? I’m not saying I can live from serenity at all times, but I did this weekend. I saw Love and Absolute Good everywhere. Absolutely! That’s why I shared the story, but then I realized that combining Principle One and Principle Two gives me more than just a ‘little’ faith – it gives me great joy and exuberance! The brakes on Betsy Buick need work so she sits idle in the parking lot for now. When my neighbor Derek found out (you may remember him from my 9/6/12 post), he gave me a big, warm teddy bear hug – so sweet! Damian, a neighbor that is a mechanic, came and knocked on my door and checked the brake fluid and lines for leaks & wouldn’t take a dime. Suzy & Roberta recently lost their 15 year old cat to kidney failure. They knocked on my door late one night in full-blown grief asking about the crematory services at the vet clinic where I volunteer. When I contacted the office manager, she didn’t bat an eye and talked them through what to do step-by-step. They brought me dinner not too long ago – man, those girls can cook! In my last post, errrr, I mean Nonni's post (grin), we told you about the latest puppy I rescued. Well, my new, quiet, wonderful neighbors above me, Gino & Talia, helped take care of him while I was at work. It wouldn't be a success story without them. How wonderful is that?!? The point is, I see love everywhere now and it is transforming my neighborhood, beginning with me. I will get Betsy’s brakes fixed as soon as I can, but in the meantime my niece and her husband have loaned me their van. I only had to walk to work one day. A co-worker gave me a ride home that afternoon, and the next day my niece drove all the way here to leave me the van – the day before they left for vacation! The picture at the beginning of this post was taken while I was at their house on Saturday (you can see a photo of them in my 5/5/12 post). Her husband changed the oil and had the tires rotated on the van so I can drive it a little longer. Talk about love! Even when Betsy is running, I don’t drive her very far from the apartment. 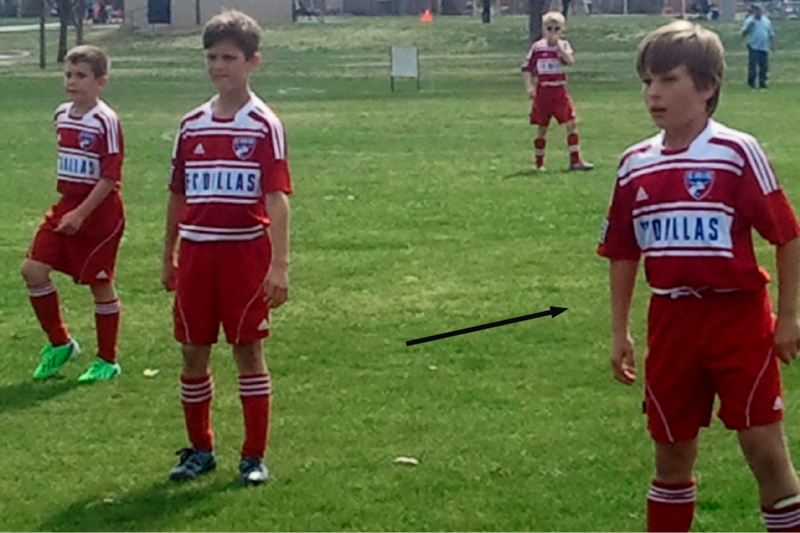 Since I have the van, I was able to go to my nephew’s soccer game over the weekend (same family). What a treat! It was super fun and the weather was great, but when the game was over I noticed one of Wesley’s friends was crying. He was trying not to, but couldn’t help himself. His family was packed up and headed to the parking lot. Wesley’s mom discreetly pointed it out to Wesley who immediately went over and started walking with his friend to the car. 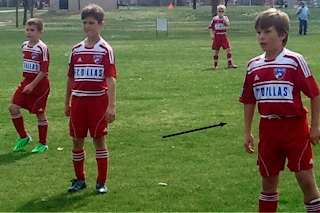 He walked the length of the field with him, and had his small hand on the back of his friend’s shoulder the whole way. The family kept walking while the 2 boys talked quietly to each other. Soon his friend was walking taller, with chin lifted and both boys laughed before Wesley came running back and joined some other friends at play. I don’t know what his friend was upset about or what Wesley said, but it was a beautiful expression of love. I affirm: God is Absolute Good, everywhere present. Human beings have a spark of Divinity within them, the Christ spirit within. Our very essence is of God, and therefore we are also inherently Good. I’m reminded of a song by the Beatles, “All You Need Is Love.” I saw love everywhere, all weekend. I hope you did too my wonderful readers. Thanks for being here! I wonder if I might ask you a quick question about "the hood," though I do not seem to be able to email you without a Gmail account. Would you please ping me back at santhony2003@hotmail.com? Thanks! Awesome! Yes, God is Absolute Good and so glad you are finding His love around you. Amen is really all I could really think of while reading your post. Have a Blessed day. @ Shirley - What a sweet thing to say - Thank you! I hope you have had a blessed AND restful day upon your return home. HugZ! so you are now looking UP because you are looking UP... i am so glad your hood is loving you and you are loving them. this is a great post and it makes me happy for you to read it.... your family helping you is wonderful. @ Sandra - love that... looking UP - perfect! It really does mean a lot to me when I log on and see your comments. So glad you're still here! HugZ! So glad to hear from you and Naomi, glad things are going well, God is in charge and you've got the right attitude. Oh yeah attitude is everything. Now I've got to change my attitude because I need too to get where I want to go. I Have a Google account but I can't use It to make comments here I have to do it under anonymous and then of course add my name at the end. Computers or in this case Ipad. (((Hugz))). Just Dave San Diego. Testing, trying to use Gmail account attempt number three. 3/7/13 - Yo, You Still There?